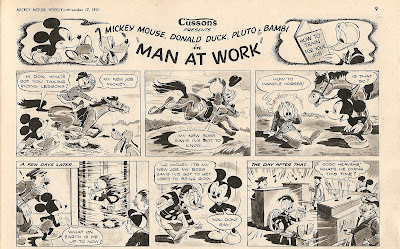 Britain's Mickey Mouse Weekly is notable for, among many other aspects, featuring original, ie. 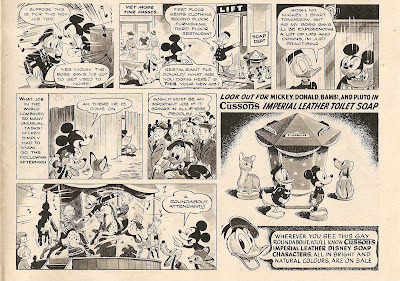 British-made, Disney comics for most of its duration from 1936 thru 1957. However, the above scan (from no. 601, dated Nov.17, 1951) is of a rather unique British gag-comics in that it has been commissioned as a tie-in to a British Disney merchandise. Not only is the plot of the comics related to the concept of the promotion strategy of the soap, but the merchandise itself also appears as a plug-in at the second panel of the third row. Another one-pag gag comics promoting the same soap brand was published in no. 615 (dated Feb. 22d, 1952).